Mikalojus Konstantinas Ciurlionis (1875-1911) was born in the southern Lithuanian town of Varena, near Vilnius. Doubly talented, he was a visual–composer who could hear colours and see sounds and whose life was comprised of the close interaction between musical and artistic composition. In his homeland of Lithuania, Ciurlionis was celebrated as an exponent of musical modernism and the founder of a national school of music. Yet he was without doubt an avant–garde artist of European standing, an artistic visionary between the late Romantic and Modern ages. Many prominent personalities of that time—Romain Rolland, Igor Stravinsky, Jacques Lipchitz, Isadora Duncan—were interested in Ciurlionis. This, the third recording in the series, introduces piano works from early and late compositional periods of Ciurlionis. The beginning of the recording is devoted to the latter period. This sequence is grounded on the argument that the early works of the composer would be better understood and comprehended after familiarisation with the mature Ciurlionis’ style, since they point to the creative strivings of the composer. Early works are primarily a mirror of the cultural surrounding of a composer, exhibiting formation of a more personal style. Nevertheless, these youthful works already anticipate certain tendencies and elements of musical language of later Ciurlionis. They also frequently delve into the melodic vocabulary of Lithuanian folk music, which with time permeated every layer of the composer’s music. 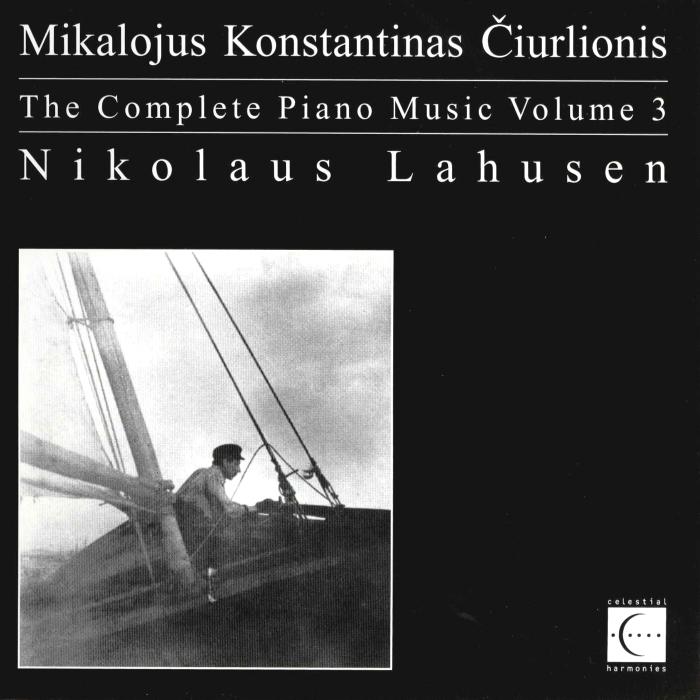 Recorded at Bavaria Studios, München, as a co-production between Celestial Harmonies and Bayerischer Rundfunk, this is volume three of the first–ever recording of the complete piano music of Mikalojus Konstantinas Ciurlionis, performed by Nikolaus Lahusen. Among the leading pianists of his generation, Lahusen has given concerts worldwide and has appeared in important concert halls (Philharmonie in Munich, Musikhalle in Hamburg, Beethovenhalle in Bonn, etc.) and with leading orchestras. For Celestial Harmonies, he has previously recorded Orff-Schulwerk, Vol. 3: Piano Music (13106), The Complete Piano Music of Mikalojus Konstantinas Ciurlionis, Vols. 1-2 (13184 & 13185), Franz Schubert Sonata B Flat Major D. 960, 3 Klavierstücke D. 946 (13195), Franz Schubert Sonata D Major D. 850, 34 Valses Sentimentales D. 779 (13221) & Franz Liszt Transcriptions of Franz Schubert Songs (13228). The project is now continued with Ciurlionis's greatgrandson, Rokas Zubovas, as a co-production with Bayerischer Rundfunk, and with Darius Kucinskas as musiclogical adviser. 8 Prelude b-moll VL 306 (Op. 26 Nr. 1) 1'28"
9 Prelude f-moll VL 307 (Op. 26 Nr. 2) 0'39"
10 Prelude g-moll VL 310 (Op. 26 Nr. 3) 5'22"
11 Prelude VL 311 (Op. 26 Nr. 4) 1'08"
12 Prelude Des-dur VL 250 (Op. 29 Nr. 3) 1'33"
13 Fughetta d-moll VL 315 (Op. 29 Nr. 2) 0'57"
14 Prelude d-moll VL 320 (Op. 29 Nr. 4) 1'33"
15 Fughetta a-moll VL 316 (Op. 29 Nr. 1) 1'08"
16 Iséjo Mergaité I+II VL 278 1'57"
17 Oi Giria, Giria I- V VL 276 1'38"
18 Ganau Aveles VL 282 0'34"
19 Vai Mociute I+II VL 277 (Op. 10 Nr. 7) 1'26"
20 Mociute, noriu miego VL 281 0'40"
21 Ei, mergele I-III VL 283 2'18"
22 Sériau Zirgeli VL 292 0'45"
23 Kad Ir Nezinojau VL 290 0'27"
24 Prapuoliau, Mociute VL 291 0'55"
25 Ant Kalno Gluosnys VL 289 0'28"
26 As Pasejau Rutele VL 280 0'52"
27 Vienam Kiemely I+II VL 274 1'10"
28 Daina VL 287 0'38"
29 Békit, Bareliai I-IV VL 279 2'23"
30 Subatos Vakaréli I- IV VL 286 1'39"
31 Oi, Lekia, lekia I-IV VL 273 2'11"
32 Séjau Ruta VL 179 (1900) 1'28"
33 b-moll VL 133 2'23"
34 A-dur VL 158 1'23"
35 d-moll VL 139 0'54"
36 fis-moll VL 185 (Op. 7 Nr. 1) 2'20"
37 H-dur VL 186 (Op. 7 Nr. 3) 1'47"
38 Des-dur VL 187 (Op. 7 Nr. 2) 0'58"
39 a-moll VL 188 (Op. 7 Nr. 4) 1'07"
40 c-moll VL 216 (Op. 9 Nr. 1) 1'48"
41 B-dur VL 217 (Op. 9 Nr. 2) 1'17"
42 Fughetta h-moll VL 262 (Op. 9 Nr. 3) 1'48"
43 Prelude G-Dur VL 88 0'33"
44 Elegija VL 191 2'19"
45 Pjesé A-Dur VL 246 1'19"
46 Dainelé VL 199 (Op. 11 Nr. 2) 1'03"
47 Muzikinis Momentas Des-Dur VL 180 1'37"
48 Mazurka b-moll VL 119 1'28"
49 Mazurka a-moll VL 171 1'07"
50 Mazurka e-moll VL 172 1'18"
51 Mazurka Ges-Dur VL 193 1'49"